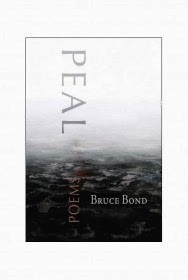 Bruce Bond is the author of nine published books of poetry, most recently Choir of the Wells; A Tetralogy (Etruscan, 2013), The Visible (LSU, 2012), Peal (Etruscan, 2009), and Blind Rain (LSU, 2008). In addition he has two books forthcoming: The Other Sky (poems in collaboration with the painter Aron Wiesenfeld, intro by Stephen Dunn, Etruscan Press) and For the Lost Cathedral (LSU Press). 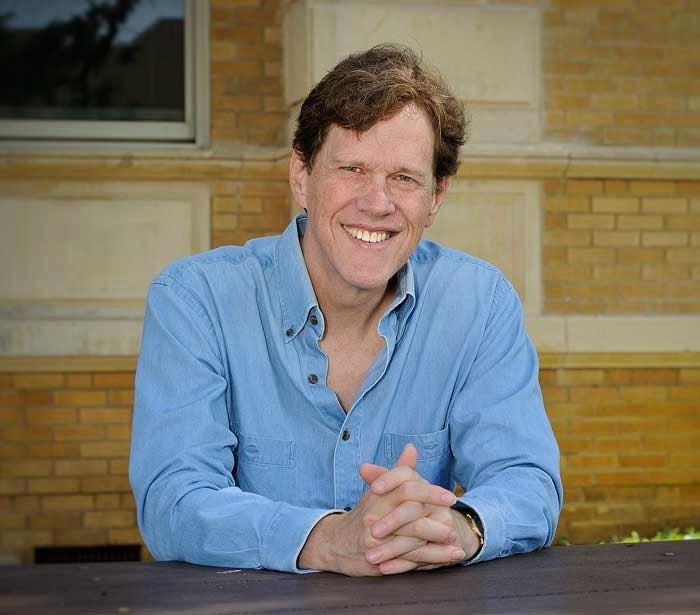 Presently he is a Regents Professor of English at the University of North Texas and Poetry Editor for American Literary Review. Karen Schubert: It is our good fortune that you’ve been publishing collections of poetry for two decades and change. How do you see the shifts in your work? What are the challenges of an experienced poet? Bruce Bond: I suppose the work has become more developed—a lot more, I hope—with greater intellectual, formal, and emotional range. Well, that is what I strive for. I remember when I was a student, one teacher, Don Revell, told me I thought too much, and another teacher, Robert Pinsky, told me to think harder. They were both right. I had to learn to trust both instincts more strongly depending on what the poem was demanding at any particular moment. When I look back at my early books, some of the poems feel stiff to me. They lack sufficient adventure, particularly in their meditative follow through. They need to go both farther outward and farther inward at the same time. They seem timid with their discourse. They rely too heavily on the image and the uncanny to evoke wonder—those poems were easy to publish back then. Many seem now like they need to ask tougher questions or risk a greater inclusiveness of tones, a greater resourcefulness of rhetorical and formal approaches that would invite difficulty as a source of meaning. Naturally if one writes formal work, as I do, over time one handles the demands of the form with a bit more speed, so the process begins to have more in common with that of writing free verse, which is a good thing. My experience writing in forms is akin to that of playing music in measures—that is, it gives me pleasure. Not the pleasure of working within a set of conventions and invoking the authority of that. That just seems silly to me. I don’t care about correctness in formal writing anymore than I care about it in music. But beauty is another matter, and subversive energy in conversation with formal pattern is critical to beauty’s power. Over time, one can incorporate more complexity into one’s music and thought without compromising the flexibility and speed that are equally critical to the feeling of authenticity, charm, ferocity, and spontaneity.Formal writing, done well, expresses an affection for some mysteriously satisfying level of musical complexity. In thinking formally, there’s no substitute for intuition. Any musician will tell you. One’s intuition gets larger and deeper as one’s tools for expression multiply. The obvious challenges of writing over a long period of time involve the expansion and evolution of one’s vision. Naturally if you are the kind of writer who feels fairly wedded to personal narrative at its most literal, then there is the greater liability of exhausting your subject matter. Mere personal narrative was never quite enough for me anyway. While I am always using my personal life, characteristically in disguised form, I am drawn likewise to the sense of movement from the local and personal to the meditative and cultural. As I’ve gotten older, I think this movement feels increasingly organic, and I have more confidence that I can trust my instincts without eschewing the larger ambitions that felt so problematic or self-important when I was young. Reading widely is huge to me as is becoming alert to the daily flood of all that crosses the eye and ear. Long ago, I stopped (or nearly stopped) laboring to please the alter-egos of teachers, editors, and critics in my head, though I know they were useful in their time. Once you realize that, wow, with a certain force of imagination and sense of what matters you can find the stuff of poetry just about anywhere, well, the poetic process explodes. So now I am more eager than ever to make a poem out of something that I have yet to learn about, some distant fact or personality who will surprise me, teach me, bewilder me. KS: What have you read recently and what’s queued up? BB: I’ve been reading Rollo May’s The Meaning of Anxiety, one of his earlier works written in 1950, and I must say, it’s terrific, perhaps a bit more provocative with ideas than his later more popular books and hugely useful, extremely lucid—I think of anxiety as the central human problem that fuels a million symptoms and cruelties as well as creative achievements and awakenings. Also I’ve started Flesh in the Age of Reason: The Modern Foundations of Body and Soul by the late Roy Porter. Kierkegaard, Arendt, and Tillichare writers I first encountered in college and have needed to revisit throughout my life since their themes strike a little deeper as I get older. Also I’ve been enjoying Jeanne Marie Beaumont’s and Paisley Rekdal’s poems. As for the future, I plan to read Ernest Jones’s Essays in Applied Psychoanalysis, Gordon Rattray Taylor’s The Natural History of the Mind, all of Jack Gilbert’s poetry (again), Robert Pippin’s book on Nietzsche and Psychology, and June Singer’s book on Blake. Ideally, I like to read the kinds of books that are powerful and timely enough that I might have a dream about them. KS: Talk a bit more about your study of anxiety, and how it informs your reading and writing poetry. BB: Tillich talks quite a lot about it in The Courage to Be—anxiety as the fallout of non-being in its various forms: non-being of the personal body, of an ethical structure to things, of an epistemological ground. Such are existential themes actually, and no doubt Tillich was hugely influenced by Kierkegaard who, in spite of his reluctance to make generalizations about periods of history, recognized an increase in anxiety as a marker of his time. Asour knowledge has grown exponentially, he said, our capacity for certainly has diminished. When you think of the various problems that people face interpersonally, they often have their roots in styles of dealing with the issue of nothingness and its potential static in the psyche. Folks can become zealots, compulsive consumers, or control addicts. They may want to structure the chaos, the way a schizophrenic structures her weak sense of self via the interlocking pieces of conspiracy theories. Out of anxiety, people can insist upon purity to the point of cruelty. They ram planes into buildings to nail their message to the wall. They take their lives for no cause whatsoever because the nerve storm becomes so painful. Or anxiety can manifest itself in a cry for love—the greater the anxiety the more deaf it can become to a lover’s needs. Whereas fear tends to have a more focused object, anxiety is harder to address because it is so diffuse. We all have it, and many of our primary motives, our disciplines, our medications, our tastes, our compulsions, our creative efforts, our identity structures (both personal and collective), and our belief systems are conditioned by it. One thing Rollo May points out is that creative people often have higher than average degrees of anxiety. This is in part because they are eager to see possibility all around them. This experience of freedom is also an experience of uncertainty and doubt. I think I can relate to all that. Maybe most people can. Rollo May is channeling Kierkegaard when he says that creative people are also blessed with a fantastic means of transfiguring their anxiety, making something of it, burning it as fuel, seeing with it into the human condition. So they are both challenged and gifted in this way. Actually I believe we are all creative, in our dreams and styles of engagement, and our expressivity in being so is part of mental health. In my books Choir of the Wells and a newly completed manuscript called Words Written Against the Walls of the City, I am particularly interested in the concept of nothingness—not simply as a source of existential angst, but more as the notion of “no thing” or that elusive force beyond discernable forms that makes the appearance of new form possible. Seen this way, the nothingness we tend to fear occupies a space similar to the unaccountable origin of things. Think of Blake’s complaint against the empiricists as creating a model of the world that gives us “the same dull round” again and again. Sure, forms evolve new forms, but the novelty of the subsequent form must contain something unprecedented. New being has come into being. The origin of being, if we are to imagine it has one, is “no-form” in communion with the forms as we know them. This idea has a way of making nothingness into a less threatening space, and I have found repeating the word “nothing” with this in mind to be a comfort. It has even helped me sleep on occasion. 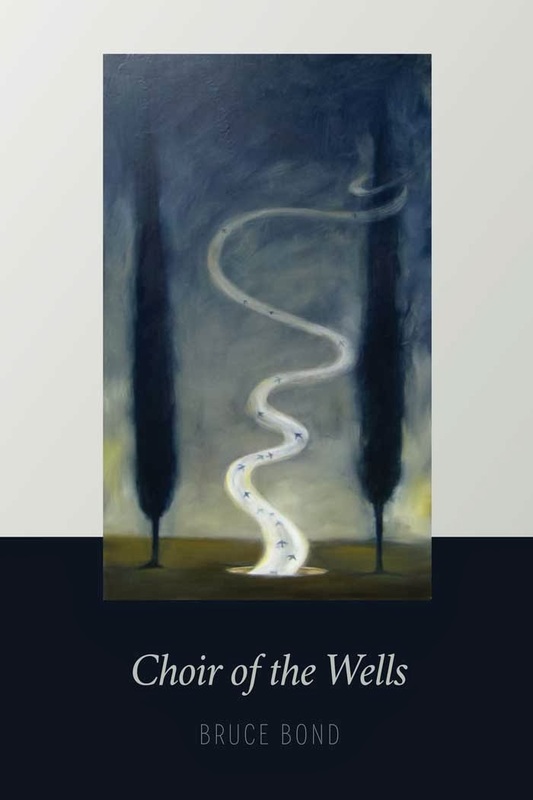 Such themes are everywhere in my poems if you start looking for them—particularly in Choir of the Wells, a book that explores the mind-body problem, which, in my mind,sheds light upon the spirit-matter and form-content problems. Consciously or not, the creative act can calm us as form of intimacy with that benign and life-affirming quality of “nothing” and its comingling with all things. KS: I’ve been thinking a lot about obsession, the way the human brain seems primed to catch on something, and how the result of that impulse is so various. I think what you’re saying is that anxiety is the pump. The poem I keep coming back to in Choir of the Wells is “Fiat Lux” which begins with a dream–jumping into water to save a drowning dog–causing the dreamer to wake to the outside sound of rain, leading to thoughts of the death of a friend. There is so much missing in this poem: the dog, reality when we are dreaming, the realm of dreams when we’re awake, our friends who die before us, the deceased’s father, the father’s faith, and in a sense, the missing thing or things we’re looking or longing for in our dreaming and waking states. The line I keep coming back to is “If light is spirit, dark is meat.” It’s a chilling line, so gorgeous, so fresh in its philosophy, and I see how we have the light and the dark, but never both at once. Other themes in the work include alcoholism, the loss of a limb, slavery, fire, Jimi Hendrix. It is a remarkable book, two hundred pages of poetry, and nearly five pages of acknowledgements alone. What was the process of writing and shaping this collection? BB: You have noticed something that actually helps me see the connection between the line you quote and the book as a whole. That is, loss appears embedded in affirmative will the way dark is embedded in light to make mindfulness possible. The line that follows the one you quote is: “Each alone is blindness.” Dark is just as important to making things visible in a literal sense as light is. So that part of the poem explores the mysterious relation between spirit and flesh in ways that refuse the elegiac consolation that dismisses the flesh as something to transcend. When the flesh appears to be mere flesh, abandoned in death, then there is the ache of some separation that intensifies a certain burden of the mystery. The complicating notion you find in the book is that separation is essential to mindfulness as well. Our experience with language for instance is one of asserting differences in order to forge continuities: bridges made of the distance to be bridged. I did not originally intend to write one big book. Rather I wrote four more focused books and sent them off to Phil Brady at Etruscan Press to see if he might have an interest in picking one. He saw all four as one project, one book, and I warmed to the idea. It would take another year at least before I had a singular book that worked in my mind as one vision with many parts. The writing of the poems before each main section helped. I axed a lot of poems and supplied others. I revised freely. It was one of those fortuitous accidents or perhaps unconscious intentions that the section titles would invoke the four elements. That structure appears obvious and meaningful to me now. I suppose I was aware on some level that the elemental themes long to explore a larger more evolutionary context out of which our personal challenges emerge. Certainly I did not design a tidy book wherein each element would have its section. I don’t think that kind of book would have been interesting to me, and I am glad I did not set out to write this book that way. I am more invested in the mercurial poem, section, or book that, in its appetite for the meaningfully new, embodies both a focus and a sense of rebellion. I like books that are questioning, rangy, tonally fluid, but nevertheless resonant via conversations among the parts. I also think a bit like a composer when I order things in a book—I want to build and pull back in ways that feel refreshing when they come, and I want the silences and section dividers to accentuate and enlarge the poems, to echo and propel. I suppose most poets do the same thing. In short, the process of putting together this book was many processes. Some poems were written with the book in mind, others not. And after I had a large critical mass of poems, I saw the eventual order emerge. The book is closely associated with a period of my life when I passed through some medical challenges of my own, plus those of my wife and my friend who died of alcoholism. Also my parents’ final years haunt this book some. No doubt much of the identity that emerged owes its coherence to the general season of difficulty that pressured the poems into being. But beyond that, I wanted increasingly for difficulty to inspire curiosity and play, and I wanted that curiosity to connect my own bodily and spiritual challenges with the beauties, absurdities, and necessities of the natural world. KS: In a recent piece on Gerard Manley Hopkins in Poets & Writers, William Giraldi notes, “The difference between a major poet and a minor one is that the major poet writes into the density of language while the minor one merely floats on top of it.” Do you follow Giraldi’s thinking? Who are the masters you return to? BB: Well, that’s a fascinating quote that admittedly needs context. In reference to Hopkins, one can see that the poet relishes and embraces the medium in terms of both its rhetorical and its semantic density. In addition to being very musically driven, with repeated stress and alliteration figuring as thematically and emotionally resonant as opposed to merely ornamental, Hopkins’ work is very diction-driven. Other poets in that category might be Hart Crane, Geoffrey Hill, D.A. Powell, and John Ashbery. Such poets write into that particular form of difficulty and pleasure and so foreground the medium by way of encouraging mindfulness word by word and making that mindfulness, at times, problematic. I find that kind of work frequently rewarding, but naturally there are considerations of vision and voice—the sense of the poem as relational with regard to a reader—that might demand slightly different registers and resources. Poems often cry out for at least a sense of genuine speech (however periodic and mercurial) as part of their inclusive power. Alas, some poems can risk a kind of decadence wherein their subject becomes too narrowly “the word” and not quite enough “the world.” To all too easily conflate the two is to lapse into the more superficial aspects of postmodern decadence. OK, that said, Giraldi’s notion goes farther and applies to major poets with a variety of strengths. The major poet is grounded in the lovely complexity of the medium, and the nature of poetry (including the force of the line in its influence on time and awareness) ideally puts that medium under pressure. The pressure of attention provides another way of thinking about “writing into” language—major poets aspire to be very active in registering and thereby transfiguring the fullness of their medium: its physicality, its history, its emotional valence, its music, its relation to speech or lack thereof, its layered precision and elusiveness. All these elements work to wed the poem to its form, to create a feeling of integrity, a sense of the right words in the right order. To understand this is to understand what Frost meant when he said that poetry is that which is lost in translation. On the other hand, to “float on top” of language might be akin to satisfying oneself with an underlying medium that is a “given.” Language in that case might be simply “used” as a relative transparency rather than engaged as a dynamic complexity in which to participate. Minor poets imitate nature. Major poets are forces of nature. As for the models I return to, well, Stevens, Dickinson, Donne, Auden, Rilke, Merwin, Whitman, Yeats, and Eliot have all been huge to me at different times of my life. Stevens is the most obvious influence, largely because he is working in a meditative mode that is too intellectual to be merely surreal, too imaginatively daring to be merely philosophical. I long for more vulnerability in him sometimes and a greater repertoire of registers, but hell, he is brilliant and moves and enlarges me to no end. Yeats was the first poet rock-star to me—I fell in love with how the poems sounded before I felt the true force of insight in them. Whitman is an unlikely influence, but there is something in his compassionate audacity that I find enduring, rare, and genuinely useful. He is not a poet of many ideas (he is an elaborator by nature), but the ideas he has are enormous. Dickinson is far more slippery and intellectually fierce, more layered and generous in that way. I would sooner return to her work than Whitman’s for this reason. Donne too has that love of paradox, a voracious curiosity, and a sculptor’s sense of beauty. Merwin was the guy who led me deeper into the freedom and intensity of the South American surrealism, which I love generally as well. At his best Merwin’s poems seem to fly ahead of the poet toward something both unfamiliar and necessary. I love that. Rilke epitomizes the visionary with a great instinct for odd and archetypal tensions that are both surprising and boiled down. Like Merwin, he can be very fast and so his poems strike deep—just the right number of feathers on the arrow. Auden was my mom’s teacher, so I have a reading list he gave her. What strikes me about that list is something that I tend to admire in Auden more generally. He was hungry for ideas of a philosophical and psychological nature, and so his poems risk being wise in the best sense, bristling with intelligence. Eliot, well, people seem to love to hate him for all the familiar reasons. I still love the discursive hunger and sinew to the poems, especially “The Four Quartets.”There’s a lovely unease in Eliot, a lyricism and imagistic force that gets swept up in some larger exploratory momentum, some attempt to say what, mercifully, he cannot say completely. You might claim something similar about all these poets. Their poems succeed in part because they fail, because they open up something bravely explored and yet unresolved, some problem, including the problem of the language itself. The best closures have a future in them, as with anything alive. KS: What emerging poets’ work has captured your attention? BB: There are many, and I am eager to see how their work develops. Most of them are strangers to me, though I have seen their work in journals and subsequently published them in American Literary Review. They include Dean Rader, Keetje Kuipers, Hadara Bar-Nadav, Lisa Fay Coutley, Derek Mong, Roxane Beth Johnson, Bobby C. Rodgers, Claire McQuerry, Jude Nutter, and Arthur Smith. Many of my students, old and new, should be on that list as well, but for fear I might leave someone out, let me just say that they have already made their mark and are poised for even greater things. I might add that I have also seen many a talented young writers fail to deepen and revitalize the work after a book or two. That period after the second book appears to be key. One has written a path into the more obvious animating tensions and found a style with some degree of flexibility and authority, so much so that the temptation becomes one of imitating one’s successes, largely in terms of the more discernible elements of form, voice, and subject matter. Around the third book, there is often a crisis point where the poet might increasingly look at the arc of one’s development as a kind of poem in and of itself. This process might well correspond with a larger crisis of priorities. Various schools of receptivity recede into the background. Old mentors become a little more human. Old formulae break down under pressure. In writing toward the unsaid, the poet might need to reach back into the bag of poetic taboos in order to enlarge the conversation and move forward, to broaden the sweep from the big picture to the near at hand and back.The poems might even need to get worse in order to get better, a lot better. One might need to renegotiate the terms in which poems are acts of both imaginative will and spontaneous receptivity. KS: It seems that the proliferation of creative writing programs has led to a bloom of literary journals. What can a new publication learn from American Literary Review? How has editing ALR changed you as a writer? or shaped your relationship to contemporary American poetry? BB: Coincident with the proliferation of journals and the writing programs that run them are the proliferation of submissions and the large amounts of attention devoted to and shaped by youth—which of course is terrific in boosting morale and interest more broadly and in welcoming an infusion that challenges the status quo.This involvement of young writers is tremendous in revitalizing the medium and its influence on culture. However one thing I notice even among the strongest young writers I know and love is that often a large portion of their early concerns will focus on form, voice, and subject matter—all of which are hugely important but nonetheless sometimes inordinately so at the expense of less discernible strengths and weaknesses. I can remember being young and hearing all kinds of taboos against the mention of “cicadas” or the use of the word “dream” or how you could not write about Orpheus or works of art any more or how meter or narrative or the lack thereof was a sign of sophistication or how poems had to be “rough” or “smooth,” theoretical or personal, political or mean—you name it. The resistance to abstraction is grounded in great insight that one needs, especially when learning what makes a poem a poem, and such resistance has its limitations.Shortcuts to literary judgment tend to isolate obvious features of poems from a more complicating context. The resulting biases are often not wholly trivial, but they tend to be consumed in questions at the most obviously apparent level as opposed to questions of poetic argument, deep structure, vision, the mercurial dialectics in all matters of aesthetics, and the genuine and emotional contribution of the poem within a larger cultural conversation. In light of all this, one important function of many of journals at universities is pedagogical whereby young editors start on that long path of seeing the big picture. Editorship is an art—which is to say, it summons from us intuitions that evolve via vast amounts of reading and life experience. Those experiences must include a whole lot of mistakes. I would say, if you are starting a journal, you might begin by soliciting some of your favorite writers, including the young or neglected ones who are writing great poems. You are building a community. That is basically what a journal is. Sure, it helps to get some well-known writers in your journal in order to attract good submissions, but the advice I give writers in general is to cultivate individual relationships with folks whose work means something to you, regardless of their reputation. I made a decision early on not to give in to cronyism in my selections. I’ve rejected a lot of friends. My sense is that, in general, they understand. Hell, I’ve been rejected this way in kind. I get it. Often it is a service to me and helps me see my work. As an editor, you want to produce a journal where someone could flip at random to any one poem there and say, wow, that is terrific, odd, powerful, and refreshingly meaningful. Or better yet, hmmm, it’s true: I really must revise my life. I don’t know how ALR has changed me as a writer exactly, other than in the ways that reading in general changes me. I am at an advantage as an editor in that I do admire poems that care about the line, poems where the line as a unit of attention offers something worthy of that kind of pressure and tempo. If you have this bias, you can move through the slush pile more efficiently. I don’t think ALR shaped my preferences in poetry so much, but it has revealed to me how little so many aspiring writers seem to care about the line, which in turn affects their whole approach to meaning, time, patterns of emphasis and interconnectivity, and the poem as richly conceptual and emotional gift. Also we get a fair number of poems that are full of mere reportage. Then there is the cold, fractured posturing that is the more ostensibly “intellectual” face of American anti-intellectualism. I’m glad someone is having a good time with all that, but it’s not for me. Both modes tend to be dulled by cliché assumptions, both theoretical and anti-theoretical, that the focus of the poetic line might help a writer to re-examine. As for my relation to contemporary American poetry, mainly I do get to support writers I like. I guess it’s that simple. I don’t pretend that publication in my journal will signify more than it does in terms of their career, but I do feel blessed that I have some small thing to offer writers whose work I love, and I can thereby add my voice to the zillions of others who are making statements about what it is that poetry can do and why it matters. My philosophy in terms of both my poetry and my editorial work is merely to do the best I can in accordance with my most inward courts of appeal and hope someone out there might notice and get something out of it. Like most people, I need to feel as though I am putting something into a community or culture—just how much is in part beyond my control. The poetic imagination is paradoxical as both a journey inward and outward at the same time. A life in poetry has a bit of the same paradox about it, given the privacy of a poem’s origins and the independent life it comes to lead as it wanders far from its source, perhaps to thrive, perhaps, as Auden put it, “to be punished under a foreign code of conscience.” It genuinely does matter to me if just one person writes to say the journal or some poem I have written or chosen for publication has benefited them. I make a habit of doing the same for other writers, strangers mostly. However tenuous the connectivity, our small conversations help us to live with the uncertainties that are indigenous to the best work. KS: This is a great list of taboos. I’ve heard them, too: no politics, pop culture or gerunds. End a poem with an image. When I disobey my mentors, I think twice about it, and maybe it makes me that much more thoughtful. Although one of my poet friends writes her poems middle finger straight up, don’t you dare tell me what I can’t put in my poems, and some of her best work arises right from those prohibitions. There is no dream for the dreamer. Why are you drawn to art, mythology, dream? BB: I think we are all drawn to dreams whether we know it or not, particularly if we understand the power of dreams more broadly as an element of waking life, as the psyche’s rebelliously imaginative capacity for images and metaphor that move mind toward meaning. Dreams speak across the many partitions of the psyche, including the semi-porous membranes of the complexes that otherwise operate with relative autonomy. This is not to say dreams always have much to say. Sometimes they are silly or addicted. Sometimes they seek the compulsive’s so-called solutions. But even the more foolish dreams are efforts of the mind to connect with itself, to make the kinds of conversations that defensive boundaries otherwise inhibit. Dreams, like poems, dip their spoon in the warm milk of, not only some knowledge waiting to happen, but also the feeling tone that persuades us this knowledge matters. They represent inwardness of course and yet likewise estrangement. They are objects so close to the eye they blur, and in so doing they articulate something fundamental about the otherness of the self and the self-revelatory power of others. Moreover a dream-like entanglement of self and other is at the core of all great poetry. That said, dreams are not poems. Poems have a medium for one thing. Also, poems are asleep and awake at the same time. Like dreams, myths are fundamental to everyone and often go unacknowledged. I am not talking about traditional myths alone, but the sustained, dynamic symbolic structures that all psyches create in order to negotiate imaginatively those things beyond the control of reason. They contain elements of dream and might indeed take the form of dream narratives, but to be myths they tend to have a mythic functionality about them, an ability to help us negotiate fundamental problems and mysteries, not by explaining them, but by giving them imaginative form. This is why Levi-Straus talks so much about opposition in myths. Particles of myth—what he calls “mythemes”—give form to opposing elements that cannot be reconciled rationally. Contrary to many descriptions, myths and dreams are both illogical and “logical,” in the ways that symbols and paradoxes are—pieces fit together to make meaning without killing the sense of mystery, irresolution,energy, and wonder that lure interpretive play. I tend to love and learn more from dreams, myths, and poems that hold me with the power of something I don’t quite understand, some hint of the summons that haunts our sleep. The dream symbol not only shields the ego, as Freud stated, it seduces the ego, awakens it, draws it in. If I write a poem and understand most everything about it, I figure, hmmm, that’s not all that interesting. It’s not done yet. To be “done,” something about the poem needs to feel unfinished. I know it has been fashionable to turn away from traditional myth and works of art as occasions for poems. I remember being told by a rather famous editor out there that he vowed never to publish another poem based on a painting. Doubtless such poems appear too familiar in cultural context or too easy in the sense that a poet gets to appropriate so much of the ready-made. But surely a good poem that makes use of myth or visual art is “about” more than the ready-made, so the “subject” of the poem would have to be far more complex and surprising than its more obvious occasion. For this reason, the excessive descriptive impulse in an ekphrastic poem renders it secondary and dull. I am most interested in the depth and emotive surprise of a writer’s engagement in any given subject, and if elements of the subject matter are familiar, that just makes more conspicuous the writer’s success and failure in terms of an original encounter. But there is another, more serious form of resistance to art, dream, and myth as subjects for poems—that is, they represent realms that are a bit removed from a world that is more historical, political, interpersonal, and thereby difficult. Mindfulness of the temptations of exotica when writing about these subjects is a good thing. In related fashion, I am fond of putting music on the defensive in my poems, begging the question of aesthetic necessity in times of crisis. Indeed that necessity is there. And a reductive view of art as mere mimesis diminishes that necessity. We honor a world less by imitating it than by forging a new vocabulary for our relation to it. Poetry seeks the world inside the heart inside the world. Art, myth, dream, and, for that matter, poems,both in spite and in light of their darkness, have the power, as Auden put it, to “teach the free man how to praise.” These imaginative forms matter to us already, yes, which is only one reason why we might write about them. The other reason is that these things can matter more, and the poet’s role is to be an active participant in the process, to be embedded in culture, attentive to its problems, and yet willfully imaginative, emotionally and intellectually revelatory, strange, soulful, seductive, various, free. Karen Schubert is the author of three chapbooks: I Left My Wings on a Chair, a Wick Poetry Center Open Contest Winner (forthcoming from Kent State Press), Bring Down the Sky (Kattywompus Press) and The Geography of Lost Houses (Pudding House Press). Her poetry and interviews appear or are forthcoming in Grist: The Journal for Writers, Talking Writing, terrain.org,Best American Poetry blog, and ArtistsPoets. Awards include a 2012 Ohio Arts Council Individual Excellence Award and 2013 residency at Headlands Center for the Arts. She is a graduate of the Northeast Ohio Master of Fine Arts.